In this Thursday, Feb. 15, 2018 photo, John Greenberg, center, 17, talks with his friends outside his home in Parkland, Fla. Greenberg and his friends are juniors at Marjory Stoneman Douglas High School, where a former student shot and killed more than a dozen people on Wednesday. Greenberg managed to escape uninjured, and was coming to terms with the tragedy by talking through it with his close friends. It was the final period of the day at Marjory Stoneman Douglas High and Jonathan Blank was in history class, learning about the Holocaust. Across campus, five of his friends, pals since grade school, sat in different classrooms watching the clock. In 19 minutes, school would be out and the buddies had plans this Valentine's Day: a little basketball and boys' time. One girl's face was covered in blood. Nearby, a boy wasn't moving. It struck Jonathan that he was probably dead. 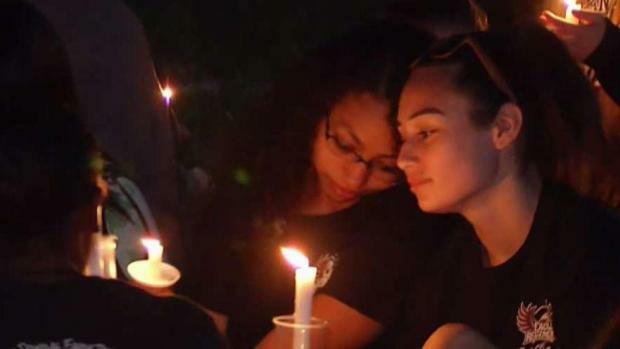 A community came together after tragedy struck and 17 people were killed by a gunman. A candlelight vigil was held. NBC 6's Michael Spears reports. The teen thought about texting his parents and of course his best friends, but he'd left his phone atop his desk and was too frozen with fear to reach up and grab it. Joey, Noah, John, Sam, Ethan — his band of brothers that had bonded over soccer, basketball and bar mitzvahs — Jonathan had no way of knowing if they were OK or if they, too, lay dying somewhere amid yet another deadly rampage inside yet another U.S. school. The six jelled quickly and had been inseparable ever since, spending hours playing Xbox or just hanging out at Jonathan's "the door-is-always-open" house in affluent Parkland, a suburb of gated developments and strip malls about an hour north of Miami. They'd even begun plotting to go to college together at the University of Florida but, as juniors, they had to get through high school first. On this Wednesday, as bullets tore through Jonathan's classroom, Joey Cordover was on the opposite side of the school in study hall. Suddenly, the fire alarm sounded — the second of the day. The students sitting around him looked at each other, confused. At first they shrugged it off as a false alarm. Then Joey and the others looked outside and saw students walking to the designated meeting spot for drills. They decided to go, too. Sam and Noah were in history class together when the alarm sounded. They, too, figured it was a false alarm, but as their class started heading outside someone screamed, "It's a Code Red!" Translation: Shooting on campus. Seconds later, they heard gunfire. The two took off running for the street as heavily armed police darted past them back toward the school. Outside on the street, where Sam and Noah stood together, rumors were spreading. They heard there may have been deaths in a history class, the one focused on the Holocaust. They knew Jonathan had that class during last period. Noah tried Jonathan's number, but the call wouldn't go through. Cell service was too jammed with everyone trying to reach their loved ones. 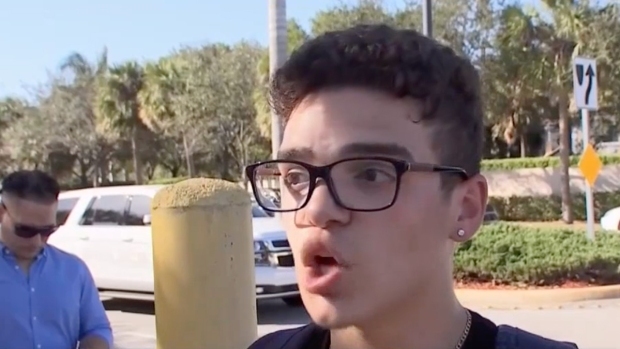 NBC 6 Reporter Tony Pipitone spoke with students who say Cruz's behavior was "erratic." Back in classroom 1214, in the building where 12 of the 17 victims, most of them students, would eventually be found, armor-clad officers burst in shouting, "Everyone put your hands up!" Jonathan raised his hands, sat up, looked around and saw ruin. Outside, surrounded by sirens and helicopters and sobbing children and parents, Jonathan texted his mother, who had already rattled off four urgent texts asking if he was OK. "They shot in my class," he responded. "3 people shot in my class." He would later learn it was four. The next morning, the six went together to a counseling session for students at the local YMCA. Then, as they so often had before, they gathered at Jonathan's place. This time, they hugged each other tight and said, "I love you, man," with no hint of irony or embarrassment. "We don't know what to do. It's confusing," Sam Resnick said, sitting on the sofa between Jonathan and Ethan. 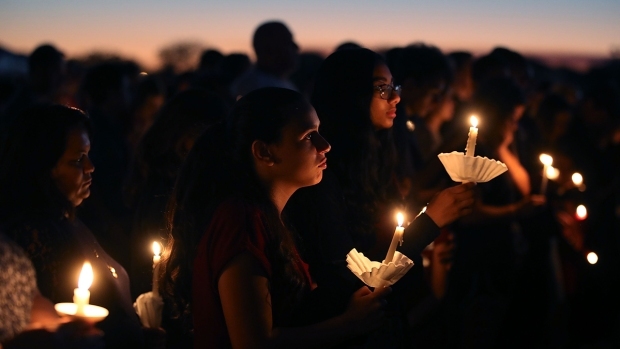 "When we're older and someone asks us where we went to high school and we say Marjory Stoneman Douglas they're going to say: 'Hey, that's where the mass shooting was,'" Noah added. "They'll put us in the same category as Columbine or Sandy Hook. It doesn't feel real, honestly." "We've created a bond you can't break," Jonathan said. "Going through a situation like this has brought us even closer together."